At least according to his fake ID. Comedy classic Superbad is a decade old this year – yup, it came out all the way back in the summer of 2007. The film first introduced us to Michael Cera and Jonah Hill (ok, Cera has been in Arrested Development, but this was his first big movie), and now they are all grown up. Jonah Hill has even had two Oscar nominations. The film also brought the world Christopher Mintz-Plasse as gawky weirdo Foggell – though you remember him as ‘McLovin’, the brilliant name on his fake ID (“What are you trying to be, an Irish R&B singer”). 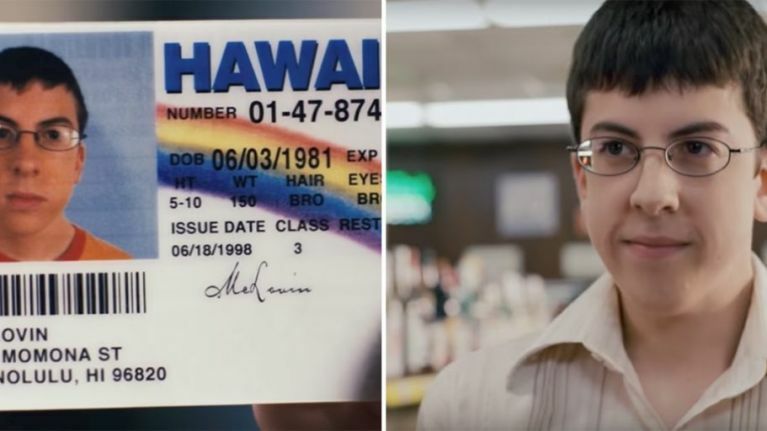 Mintz-Plassre himself is only 27 today – but today would be the 36th birthday of the fictional McLovin, according to the date on the fake driving license. According to the screenshot, 'McLovin' was born 3rd June 1981 (Americans write the date month/daty/year, remember). It’s as good a reason as any to rewatch Superbad again this weekend.